Badges — Branditright Ltd - Don't just brand it, brand it right! Create trust between you and the customer by wearing a badge to identify yourself. 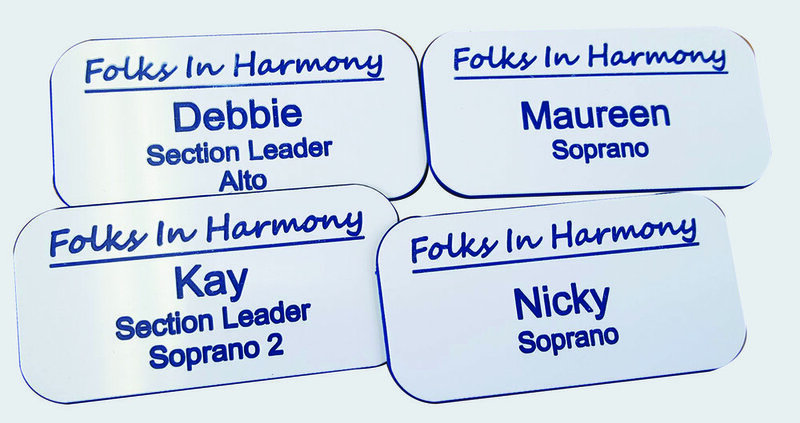 Standard sizes are available in a range of different styles of badge, from sublimated to engraved. Once you confirm which badge you would prefer, you can then pick from a range of finishes that give your badge that extra finesse. Finishes available: cropped, bevelled, round & bevelled, shaped and domed. Lastly, you will need to pick a fixing for your badge. Mix and match between standard pins, magnets, clip & pins, and rota clips. Create a unique looking badge by choosing an engraved badge. Pick two colours, one for the background of the badge and one for the graphic/text. Colours are limited as your badge will be engraved from available Satin or Micro Troply Engraving Materials. Please ask for availability. To start your badge enquiry please click the button below to contact us or call us on 02392 595124.